I had a floral image I'd colored up earlier in the month for the Daily Marker 30 Day Challenge and I was determined to make it into a card with this sketch. I had to flip the sketch to make it work, so I hope Jennifer doesn't mind! The image was colored with both Copics and Prismacolor pencils and then I went around the outside with pale blue Copic markers. I fussy-cut part of the image and die-cut the rest with a stitched rectangle die. The sentiment comes from the fabulous Essential Sentiments set by MFT. Onto the Fog card base, I added some black and white striped paper then popped up the image layer with foam tape. I finished by adding clear sparkle pen to all the flowers. Thanks for visiting! 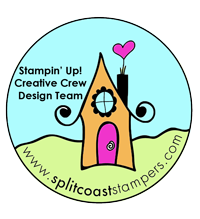 If you haven't already, I encourage you to head on over and check out the gorgeous cards made by the DT. 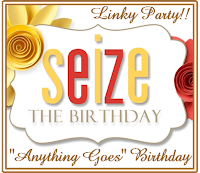 I'm going to link this card up to Seize the Birthday's Anything Goes Challenge. Oops, forgot to say thank you for sharing with us at Seize the Birthday. This is absolutely gorgeous!! And I love the way it carries over into the black/white stripe. Fabulous! such a beautiful card, coloring of flowers is fantastic and the black striped panel sets it all off so well. I love how the flowers go over the edge! Beautiful card colored to perfection! Beautiful coloring, Karren! I love how you added details with your pencils and a shadow with the pale blue marker! I also love the black and white stripes along the side...such a pretty card! WOW! I love how you fussy cut the one edge of the flowers and allowed them to overlap the striped layer. What a great look! Oh wow! This card is so beautiful Karren! Those flowers are gorgeous and I LOVE your colouring! Those flowers look gorgeous against that striped paper! So pretty! These flowers are simply amazing! What gorgeous shading. Love how you used the striped pattern to make the image pop. This is a total WOW card! I love how the flowers flow off the edge of the panel, and your coloring is superb. Gorgeous work, Karren! Great coloring on the flower bouquet. Like the stitching and the black striped designer paper, all of this combined makes one fab card! Thanks again for having me guest design for the month of June. I enjoyed my time with all of you lovely and talented ladies! This card had me at flowers! Those images are just gorgeous and your colouring is perfect (as always!). The black and white DSP is a fabulous touch!